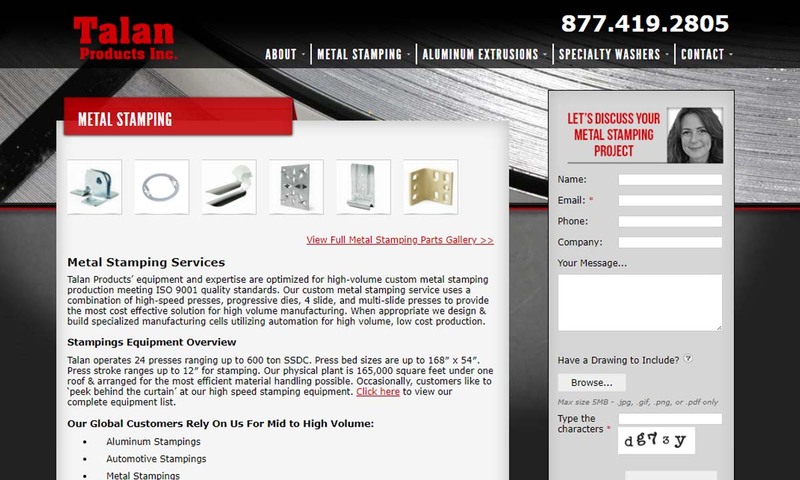 A reliable source for Metal Stamping information and a resource for accessing leading Metal Stamping and suppliers. Metal stamping is a metal forming process. In this process, stamping presses economically, rapidly, precisely and in large volumes, shape flat stock sheet metal or metal coils into metal parts. Metal stamping equipment can produce both two-dimensional and three-dimensional parts, while simultaneously or continuously stamping, pressing, cutting and forming more. In addition to stamping, the term “metal stamping,” can refer to a broader set of metalworking processes that are conducted with a press machine, such as: bending, blanking, coining, embossing, flanging, forging and punching. Metal stamping is popular with manufacturers for its ability to produce uniform parts at high volumes, all while keeping the costs low. Metal Stamping Metal stamping is a metal forming process. In this process, stamping presses economically, rapidly, precisely and in large volumes, shape flat stock sheet metal or metal coils into metal parts. Metal stamping equipment can produce both two-dimensional and three-dimensional parts, while simultaneously or continuously stamping, pressing, cutting and forming more. We take pride in all our metal stampings. We strive to provide the best quality and most cost-effective solutions for all our customers. 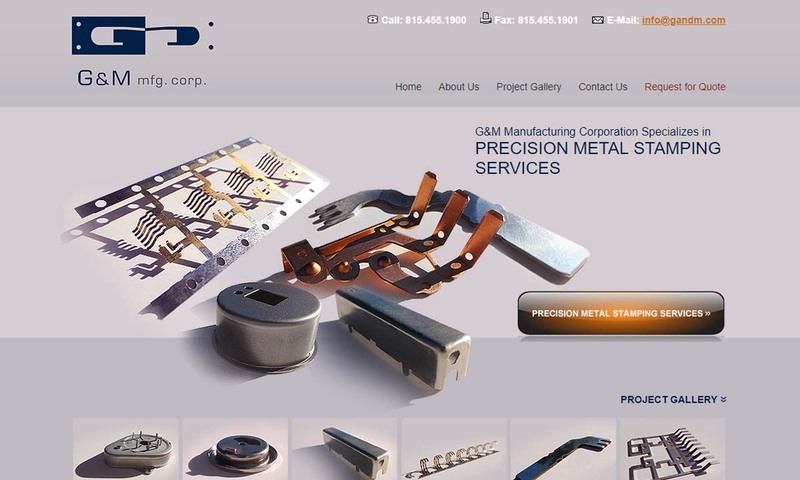 We are the metal stampings experts. We have over 30 years of experience creating customized solutions for our customers in a wide variety of industries. We are fully 9001:2008 certified, and we bring that high quality commitment to everything we do. Manufacturer of precision metal stampings for the automotive, electronics, electrical, medical, industrial & consumer markets. 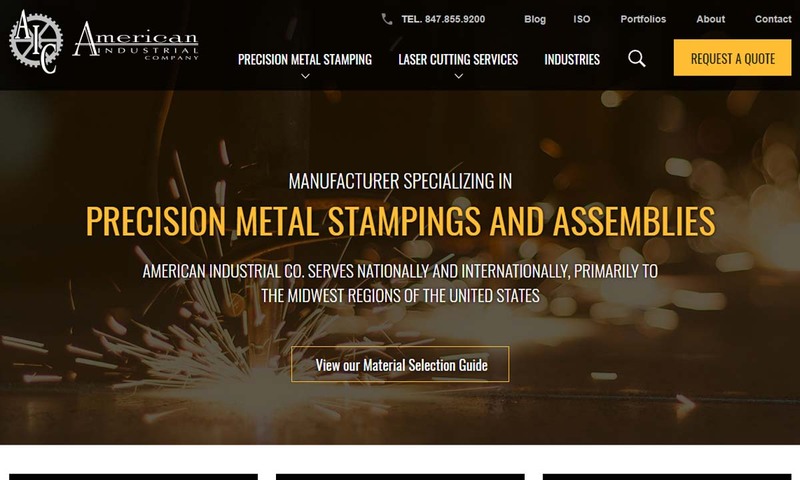 As a premiere metal stamping company in the United States, we are fully capable of producing the engineered products you need to get to get your job done. Kenmode first opened its doors in 1960 upon the philosophy of strict adherence to uncompromised quality and performance standards. 50 years later, we stay true to that philosophy in building and maintaining customer relationships. 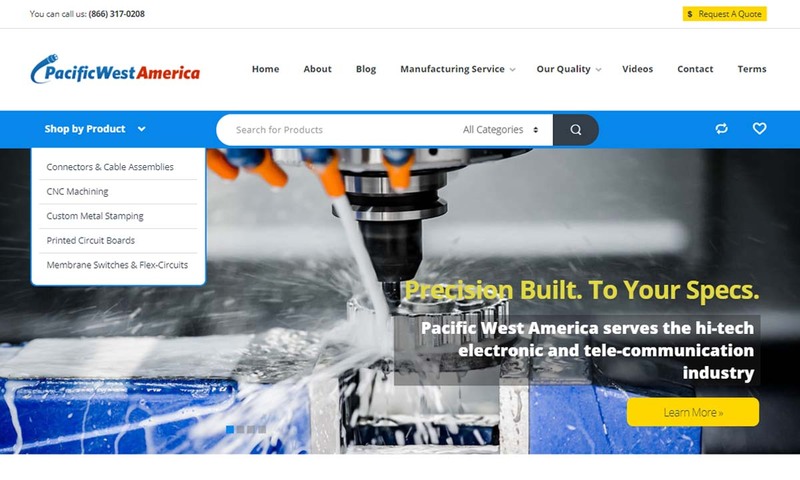 At Pacific West America, Inc. we provide custom metal stamping, CNC machining, printed circuit boards, and membrane switches. Utilizing state of the art machinery, we offer precision metal fabrication and sheet metal fabrication. The list of products manufacturers can make using metal stamping is nearly endless. Some of those products include: deep drawn stampings (deep 3D parts) like pots and pans, metal brackets, spring clips, metal clips, exterior building panels (ex. roofs, doors, bonnets, side panels, deck lids and fenders), interior building panels, metal brackets, eyelets, lasers, gauges, radio system components, medical stampings, helicopter parts, vehicle engine parts, weapons parts, navigation systems, landing gears and dimensionally critical panels. Metal stamping is also used to make jewelry, household items and plumbing accessories. 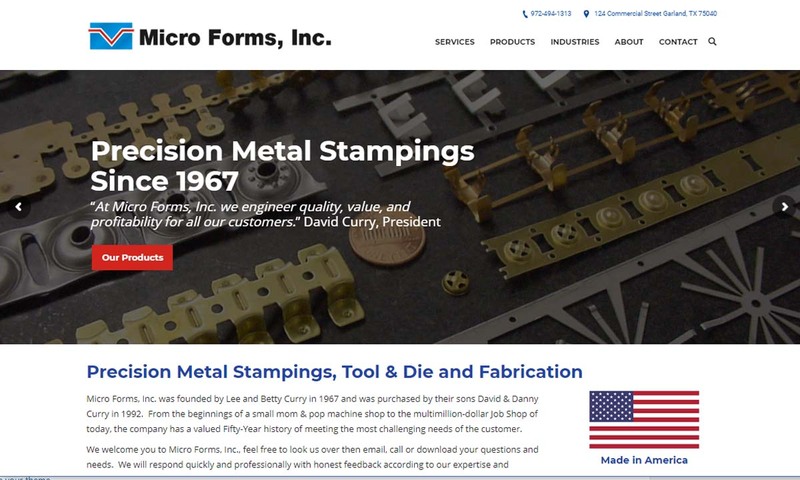 Sheet Metal Stampings – Micro Forms, Inc. The earliest examples we have of metal stampings are coins that were struck (not stamped) a people called the Lydians in the 7th century BC. These people, who lived in what is now Turkey, created coins by placing a gold or gold alloy pieces between a die with one image and a stamp with another. Once the metal was in position, they would hit the whole tool and die assembly with a hammer. People continued to use this metal stamping method until German silversmith Marx Schwab invented a metal press to go along with the die. It was quite large and could be operated by up to 12 workers at a time. His invention, debuted in 1550, came to be known as a screw press. Metal stamping really came into its own during the Industrial Revolution. This started with manufacturers using the process to fabricate bicycle parts. Finding it to be inexpensive and efficient, manufacturers quickly began metal stamping as many products as they could. At the turn of the 20th century, Henry Ford turned to metal stamping for the machining of parts for his car, the Model T.
Since then, the metal stamping process has not changed much, except in respect to automation, power sources (electricity, pneumatics, hydraulics, etc.) and the materials available for stamping. Today, metal stamping permeates our society, especially our cars. In 2014, experts valued the automotive stamping industry at over $31 billion. Meanwhile, they expect the electronic stamping industry to be experiencing a compound annual growth rate (CAGR) of 5.4% by 2022. Needless to say, it is a great time to invest in metal stamping. A variety of materials are compatible with metal stamping, such as zinc, nickel, steel, brass, aluminum, copper, titanium and many alloys. Zinc is a naturally occurring element that metalworkers frequently use as an alloy base. Alone, it is brittle and difficult to form, as an alloy ingredient, if offers galvanization resistance and corrosion resistance. It is, for example, an important component of brass sheet metal fabrication. Nickel is another naturally occurring element. It is far more successful on its own than zinc, though. It boasts many positive properties, most notably: magnetism, corrosion resistance and ductility. Steel is an important iron-carbon alloy. It offers superior tensile strength, good corrosion resistance and thermal conductivity, high yield strength and high durability. Galvanized steel is especially strong. Steel stamping is used to create a wide range of high strength products. Brass is an alloy composed primarily of copper and the aforementioned zinc. Brass is somewhat corrosion resistant, but not super strong. It is, however, quite aesthetically pleasing. So, it is best for use when manufacturers want to make decorative stampings. Also, jewelry, plumbing and household fixtures are commonly fabricated from brass stampings. Aluminum metal is: soft, malleable, corrosion resistant, electrically conductive, thermally conductive and nonmagnetic. Copper is another element found in nature. It is electrically conductive, thermally conductive, formable, malleable, soft and a common alloy ingredient. Copper sheet metal stampings are ideal for large automotive and deep drawn metal stampings, as well as large pots and pans. Beryllium copper is the strongest copper alloy. It is known for its resistance to: abrasive wear, galling, plastic decomposition products and non-oxidizing acids. It is also known to be: electrically conductive, durable, weldable, machinable and ductile. Titanium is a metal known for its exceptional strength and strength-to-density ratio, its high corrosion resistance and its lightness. Titanium stampings are common in healthcare, defense and aerospace. The metal stamping process, in general, functions with the assistance of a slide, or ram, a press bed and a stamp die or stamp tool. (Sometimes this process calls for multiple dies and/or punch presses.) The process itself can be broken down into a few simple steps. To start, manufacturers insert the sheet metal into the press bed, which is a stationary table. Then, the die, which is a tool consisting of a custom-designed cavity, shapes metal parts from the inserted sheet metal. The upper part of the die connects to the press slide, which maintains movement to and from the press bed, while the lower connects to the press bed. Another die component, called the punch, completes the shaping operation by pushing the sheet metal through the die. After their formation, the metal stampings are usually undergoing one or more secondary processes. Plating, for example, boosts a part’s corrosion resistance, solderability and durability. Common plating materials include tin, nickel, gold and palladium. However, if a manufacturer wishes to avoid this step, he or she may pre-plate the metal. Other secondary processes include heat treating, deburring, cleaning and powder coating. Heat treating increases hardness while decreasing the likelihood cracking. Deburring removes sharp corners with abrasives or chemicals. Cleaning for the removal of films and oils left behind from the stamping process. Powder coating is a way to apply a protective layer to the stamping. Before completing a metal stamping, manufacturers plan out the operation based on a number of application specifications. Such specifications include: desired material thickness, desired material shape and size, standard requirements, required tolerances and required/preferred material qualities. Based on these specifications, they can map out their plan of action, including which stamping process they will use, the material(s) they will select, the die configuration and what secondary processes they will conduct. Stamping is an inherently customizable process, so manufacturers will have no trouble catering to your exact custom metal stamping needs. Common stamp machines include: mechanical, transfer, fourslide and hydraulic presses. Mechanical presses are run by producing energy in the flywheel, which is then transferred to the electric shaft, eccentric gear or crankshaft. An example of a mechanical press is the gear frame, a hand-fed, straight-framed press that is perfect for transfer die and progressive die applications. Transfer presses have multiple stations for parts to pass through, but instead of starting as one piece or coil, transfer pressed parts start as separate sheet metal pieces. Fourslide presses are automated presses that work using four slides, thus the name. Because they have so many slides, fourslide metal stampers can form workpieces along both axes. This means they can perform tasks like shaping, cutting and stamping all at once. Hydraulic presses are available in a wide variety of frames, including straight sides, C-frames, four-column and H-frames, all which are able to deliver full power at any point in the stroke. This power is delivered by rams moving in a programmed sequence, actuated by hydraulic pressure. Hydraulic presses work for precision metal stampings, short runs, deep drawing, lower speed high-tonnage blanking with long feeds and work that calls for repeatable pressure. Available in a wide range of tonnage capacities, sizes, operating speeds and stroke lengths, there are stamping presses and processes for every application. There are several types of stamping processes available to manufacturers, such as progressive stamping, transfer die stamping, line die stamping and compound die stamping. Progressive stamping, also known as the progressive die method, is a continuous process that makes small, precision parts, such as medical and electronic stampings, metal clips and brackets and spring clips. 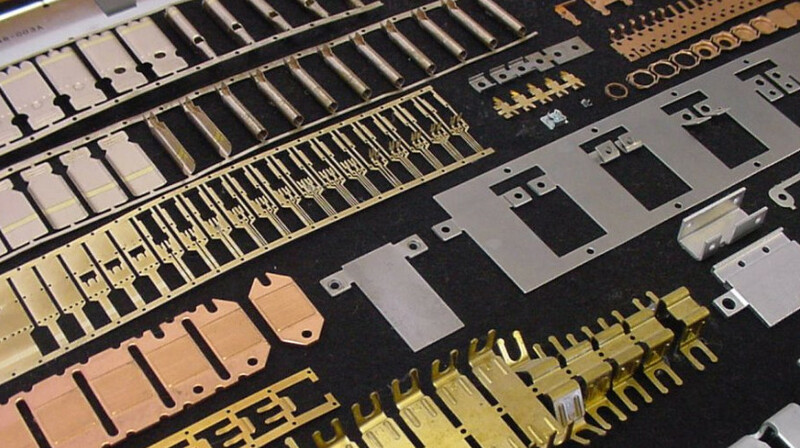 Because they are produced from a continuous process, progressive stampings are short run stampings that produce a large volume of stampings over a short period of time. In fact, progressive stamping is the fastest way to produce metal stampings. Transfer die stamping is a stamp production method that moves the sheet metal instead of holding it stationary. Transfer stamping presses are equipped with a number of different tools, which allows them to perform several tasks as they move the workpiece from one area to the next. Usually, they move the workpiece on automated rails. This is all performed on a single press, and the operation can be custom programmed. Line die stamping is a stamping process with which manufacturers can efficiently and at a relatively low cost produce large parts. Line dies are either loaded robotically or by hand. Manufacturers prefer robotic loading, as it’s safer and more efficient, but they do engage in hand loading when parts are particularly bulky or it’s a low-production run. Compound die stamping a stamping process in which the die separates the workpiece from a steel strip in just one stroke. The compound die can also perform several punches and cuts in one stroke. Compound die stamping is popular for the metal stamping of simple hardware, like washers. It can produce medium to high volumes at low costs. Metal stamping is an excellent process in which to invest. Why? First, metal stamped parts are precise, highly repeatable and capable of precision tolerances. Second, metal stamping dies have a lower tooling cost than other tooling parts, like molds, forging and casting dies and expendable cutting tools. In addition, metal stamping produces tough parts made of harder materials than other processes allow. Find out more about the possibilities by contacting a stamp service provider. If you require a high-quality metal stamping, we recommend you work with a vetted metal stamping company you can trust. Since the market is booming, competition is fierce. While this can be good for your bottom line, it also means that there are more unproven or inferior manufacturers out there looking to lure you with low prices. 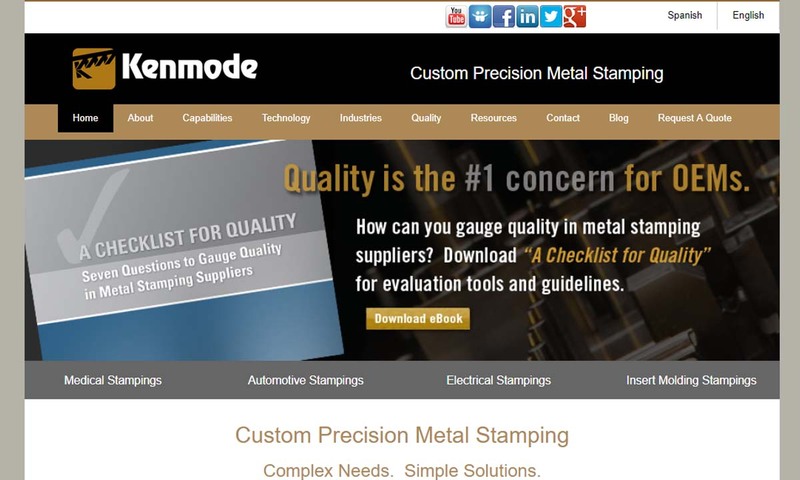 To make sure you avoid such pitfalls, we have put together a comprehensive list of experienced metal stampers we trust. You’ll find the profiles of these companies dispersed throughout this page. When you’re ready, take some to study those profiles. Pick out three, possibly four, suppliers that appear to you as though they’ll be able to best match your specifications. Then, reach out to each of them to discuss your specifications at length. Remember to talk about your standard requirements, custom requests, budget, deadline, delivery preferences and post-delivery support level preferences. Once you’ve done that, compare and contrast your conversations.  Determine which manufacturer offers the best deals (including gold member benefits), the highest quality products and the best customer service, and contact them again to get started. Good luck!